As a regional referral center for children, Children's Hospital Los Angeles is the perfect place to gain expertise in pediatric care. With outstanding board exam pass rates, our program helps residents meet their career goals and respects their personal lives and time. Our residents come from across the United States. Check our 2018-2019 House Staff Roster to see where our residents hail from. All documentation must be received before an applicant's file is reviewed. Applicant files are processed in the order in which they are received. Program staff begin interviewing potential candidates in mid-October and continue through the end of January. Overall, our housestaff complete their training well prepared for any career choice in pediatrics. 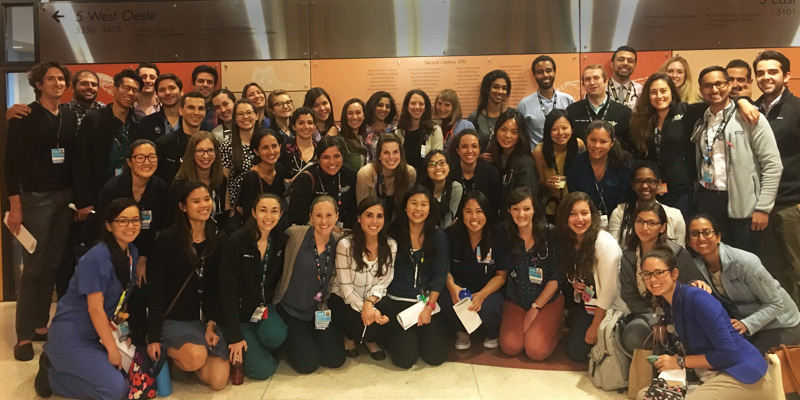 Following 3 years at Children's Hospital Los Angeles, residents choose to pursue careers in a variety of pediatric fields. Three Chief Residents are selected each year to serve as junior faculty on the medical staff. Many residents choose to go into general pediatric practice in the surrounding Los Angeles area or in a variety of locations throughout the United States. In addition, our graduates pursue many fellowships ranging from Adolescent Medicine through Toxicology. During resident orientation, several insurance packages are presented. Residents are able to select the benefit options that they want within the categories indicated below. All residents receive a meal allowance of approximately $150-$165 each block rotation that they are on call in the hospital or in the Emergency Department. There are also occasional sponsored lunches at noon conferences. Meals are also provided to residents free of charge while on rotation at LAC-USC and HPMC. The program covers PALS, BLS and NRP expenses, and reimburses the full payment for the USMLE Step III exam and California Medical Licensure fees. Children's Hospital Los Angeles residents are well prepared for the American Board of Pediatrics Certifying Exam at the end of their residency training. In fact, over the last 17 years our immediate graduates have had a 96 percent pass rate. In addition to all the educational conferences previously described, we conduct a free Board Review Course for our residents towards the end of their PL-3 year of training. There are two call rooms adjacent to each ward’s “Doctors’ Room”. The rooms are furnished with beds, telephones, computers and televisions and include adjacent bathroom facilities. Interns and residents are truly involved with our local community. In addition to providing medical care to the surrounding neighborhood, our housestaff may give lectures on important health topics to parents and students at a nearby school district, participate in numerous health fairs, give immunizations and perform high school sports physical exams. During the adolescent rotation there is a large amount of time spent working in free clinics in the neighborhood. In addition, a community clinic elective is offered to residents, which provides exposure to a variety of general pediatric issues in underserved populations. Housestaff may also choose to do additional electives in the community, which may involve direct patient care, child education and/or research. Finally, many of our residents provide invaluable service to the surrounding community through their efforts while rotating on the advocacy block and when they conduct a home safety visit for one of their continuity clinic patients during during the PL-2 year. The hospital has developed and implemented a clinical information system called KIDS – Knowledge Information and Decision Support. It allows residents to view all their patients’ clinical information on-line. With a wireless network throughout patient care areas, residents are able to access and maintain patient lists, see their patients' vitals, lab results, medication history and progress notes (by all clinicians) on-line and in real time. This creates efficiency for the residents and improves patient care. The hospital has also implemented the Synapse system to allow for film-less retrieval and viewing of radiological studies. The residency program also has a web-portal, which allows residents access to career guidance information, schedules, a learning center, advocacy information, and other useful educational material. In general, Children's Hospital Los Angeles interns and residents are off on holidays and weekend days that they are not on call. During the Children's Hospital Los Angeles ED Rotation, residents get 8 days off. During the intern outpatient rotations, all weekends are off, but 1-2 weekends are sick call. During intern year, there are 5 weeks of vacation. Four of the five weeks are taken during outpatient rotations and are usually divided into two 2-week blocks. Since interns start one week early, they get their last week of internship off, totaling 5 weeks vacation time. Second and third year residents have four weeks of vacation during each year. Vacation time is used during “free” elective months and can be used all at once or split between the 3-4 blocks. In addition, there are four consecutive days of holiday vacation during the Christmas/New Year's holiday. During this time, half of the residents will work on Christmas and the other half will work on New Year's. Residents are assigned to work an every-other-night (Q2) call during the 4-day period of the holiday which they do not have vacation. We also observe Martin Luther King Jr. Day, Memorial Day, Independence Day, Labor Day and Thanksgiving. Each ward has a "Doctors Room" designated for the ward team. In each room, there are computers for each intern on the team (with KIDS and Internet/Medline access), as well as telephones, pediatric textbooks, a refrigerator, general office/physical exam supplies, whiteboards, etc. The doctor rooms are the work rooms for the inpatient ward teams where daily work, teaching rounds and discussions with attendings occur. The hospital owns an apartment building (affectionately called "The Rodney"), which is located one block from the hospital. There are studios, one-bedroom and two-bedroom apartments available. Parking is included in a secure lot. While some of the residents choose to live at the Rodney, many live in other parts of Los Angeles (i.e., West Hollywood, Glendale, Los Feliz and near the beaches). The rental rates include free utilities. Interns are assigned to two weeks of jeopardy call during the year (during their call-free months). PL-2 residents are assigned to jeopardy call during a call-free elective with jeopardy call every fourth night (a total of seven call nights). PL-3 residents have jeopardy call during a two-week block that is free of any other clinical responsibilities (alternating nights). All residents are relieved of any clinical duties if they are post-call from a jeopardy call overnight shift. The hospital has an automated digital dictation system. Admission History & Physicals and discharge summaries can be directly entered into the computer or dictated. As in all hospitals, interns and residents are required to keep their medical records up-to-date. Meetings are scheduled every one to two months and used to discuss residency program issues. All the residents, chief residents, assistant program directors and program director attend these meetings. This is a two day/two night excursion to Lake Arrowhead in February, attended by all the interns, chief residents, assistant program directors and program director. It is a special time for fun, sun, relaxation and a little introspection. This is a one day, off-site retreat that focuses on career options, fellowship applications and fiscal planning, followed by an afternoon reunion with classmates. This is a one day, off-site retreat with information on contract negotiations, insurance choices and advocacy in practice, with an afternoon of fun and food. Situated between snow-topped mountains and some of the world’s finest recreational beaches, Los Angeles is the vibrant hub of Southern California. Its relaxed lifestyle and ideal climate offer a multitude of recreational and cultural activities, ranging from surfing, sailing and deep sea diving, to snow skiing, hiking, mountain bike riding and much more. Los Angeles is one of the few major metropolitan areas where you can be tanning on the beach one moment and skiing through knee-deep powder a quick, two-hour drive later. Whether your tastes lean toward modern art, space science or natural history, the city offers a world-class array of museums, art galleries and cultural centers, as well as an exciting roster of college and professional sports events. After the sun goes down, L.A.’s unparalleled nightlife presents an almost endless array of cutting-edge music, dance and theatrical performances, not to mention one of the most remarkable selections of restaurants to be found in any American city. There are the world-renowned Hollywood Bowl and Greek Theater, both hosting leading names in classical, jazz and pop music under the stars, while the multi-complex Los Angeles County Music Center offers critically acclaimed plays, civic light opera, musicals and symphonic works. Los Angeles is also home to celebrated regional and small theaters, television and film productions, behind-the-scenes studio tours and cinema playing everything from current blockbusters to art house classics. For Nearby Attractions, read more. Through the hospital's Employee Assistance Program, the hospital retains trained counselors available to help with a variety of issues, including relationship difficulties, family troubles, chemical dependency, work stress, and more. All sessions are completely confidential and free. Residents, with the assistance of trained facilitators, lead monthly “Wellness” sessions. Each residency class meets separately. Professional counselors are available through the hospital’s Employee Assistance Program to help individual residents manage a variety of issues, including difficulties with relationships and families, chemical dependency, and work-related stress. These support services are free of charge and confidential. See our Welcome Message to Prospective Residents. To improve patient care, our hospital has developed and implemented a clinical information system called KIDS – Knowledge Information and Decision Support. This system allows residents to view all their patients’ clinical information online. With a wireless network throughout patient care areas, residents are able to access and maintain patient lists, see their patients' vitals, lab results, medication history and progress notes (by all clinicians) online and in real time.